At Vespers yesterday afternoon the antiphons and psalms of Vespers for Saturday (Pss. 143, 144, 145, 146 & 147) were sung. The chapter was O Altitudo and the Office hymn O lux beata Trinitas. 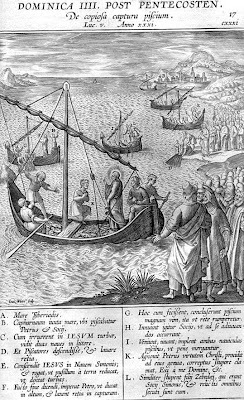 After the collect of the Sunday a commemoration was sung of SS Symphorosa and her Seven Sons. This was followed by the Suffrages of the BVM Sancta Maria succurre etc, the Apostles Petrus Apostolus etc, of the Patron and lastly for peace Da pacem Domine. At Compline the Dominical preces were sung. At Mattins the invitatory is Adoremus Dominum and the Office hymn Nocte surgentes. In the first nocturn (Pss. 1, 2, 3, 6, 7, 8, 9, 10, 11, 12, 13 & 14) are sung and the lessons are the Incipit of the Third Book of the Kings. The first lesson includes what is now most of the second lesson in modern editions ending ...qui adjuvabant partes Adoniae. The second lesson begins Sadoc vero sacerdotes and continues (including verses 9 & 10 omitted in the modern editions) until ...et complebo sermones tuos, the penultimate sentence in modern third lesson. The third lesson begins Ingressa est itaque and continues until ...Nathan propheta venit. (v.22) In the second nocturn (Pss. 15, 16 & 17) the lessons are from St. Jerome's Letter to Nepotianus. These are substantially different from those found in modern recensions. In the third nocturn (Pss. 18, 19 & 20) the homily is from St. Hiliary on St. Matthew's Gospel. These are the same as in modern editions. 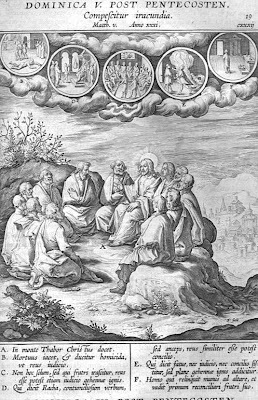 The eighth and ninth lessons are read together to form the eighth lesson and the ninth lesson is of St. Symphorosa (formed of the second and third lessons of the feast). The Te Deum is sung. At Lauds the Sunday psalms (Pss. 92, 99, 62-66, Benedicite & 148-49-150) are sung. After the collect of the Sunday a commemoration is sung of St. Symphorosa and her Sons followed by the Suffrages of the BVM Sancta Maria succurre etc, the Apostles Gloriosi principes etc, of the Patron and lastly for peace Da pacem Domine. Mass is sung after Terce. The Gloria is sung, the second collect is of St. Symphorosa and her Sons, the third collect is A cunctis. The Credo is sung and the Common Preface is sung. Vespers are of Sunday. After the collect the Suffrages of the BVM Sancta Maria succurre etc, the Apostles Petrus Apostolus etc, of the Patron and lastly for peace Da pacem Domine are. At Compline the Dominical preces are sung. At Vespers yesterday afternoon the antiphons Isti sunt sancti etc were sung with psalms 109, 110, 111, 112 & 115 for second Vespers the Seven Holy Brothers. From the chapter, O Altitudo, the Office was of the Sunday. The chapter was O Altitudo and the Office hymn O lux beata Trinitas. After the collect of the Sunday commemorations were sung of the preceding feast of the Seven Holy Brothers and of St. Pius I. The Suffrages of the BVM Sancta Maria succurre etc, the Apostles Petrus Apostolus etc, of the Patron and lastly for peace Da pacem Domine etc were sung At Compline the Dominical preces were then sung. At Mattins the invitatory is Adoremus Dominum and the Office hymn Nocte surgentes. In the first nocturn (Pss. 1, 2, 3, 6, 7, 8, 9, 10, 11, 12, 13 & 14) are sung and the lessons are a continuation of the Second Book of the Kings. The lessons are the same as in modern editions of the Breviary. In the second nocturn (Pss. 15, 16 & 17) the lessons are from St. Ambrose's Defence of David. These, again, are the same as found in the modern editions. In the third nocturn (Pss. 18, 19 & 20) the homily is from St. Ambrose on St. Mark's Gospel. The seventh lesson includes the first sentence (Consequens igitur... a jejunio liberaret) from the modern eighth lesson. In the Tridentine Breviary the eighth lesson thus begins Itaque nemo and continues with most of the modern ninth lesson until ...sed nec adhuc quidem potestis. The ninth lesson begins In modum lactis but most of its text is not found in the modern books. 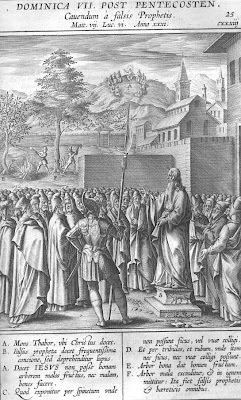 The eighth and ninth lessons are read as one and the ninth lesson is of St. Pius I. The Te Deum is sung. At Lauds the Sunday psalms (Pss. 92, 99, 62-66, Benedicite & 148-49-150) are sung. After the collect of the Sunday a commemoration is sung of St. Pius I followed by the Suffrages of the BVM, SS Peter and Paul, the Patron and for peace are sung. Mass is sung after Terce. 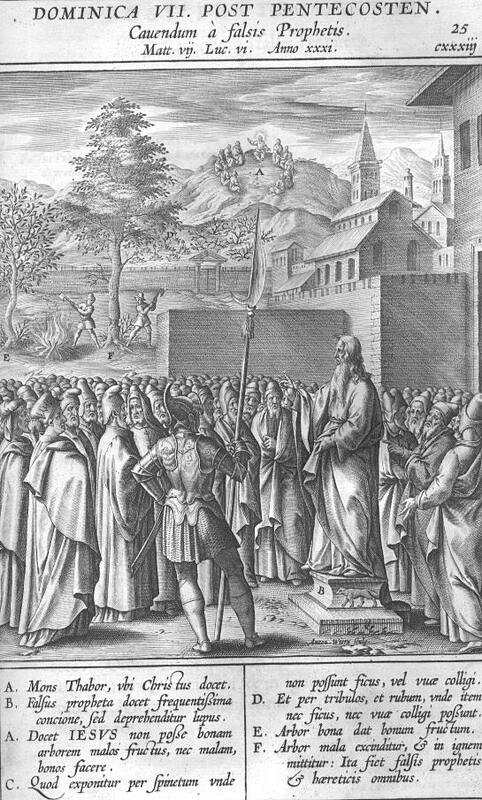 The Gloria is sung, the second collect is of St. Pius I, the third collect is A cunctis nos. The Credo is sung, the Common Preface is sung. Vespers are of the Sunday, with psalms (109, 110, 111, 112 & 113). A commemoration is sung of the following Office of SS Nabor and Felix. The Suffrages of the BVM, SS Peter and Paul, the Patron and for peace are then sung. At Compline the Dominical preces are sung. The Sunday within the Octave of SS Peter and Paul is the fifth Sunday after Pentecost this year. The Sunday retains the red liturgical colour of the Octave. At Vespers yesterday afternoon the antiphons Petrus et Joannes etc were sung with psalms 109, 112, 115, 125 & 138. The chapter was of the Sunday, O Altitudo, and the hymn, O Lux beata Trinitas. After the collect of the Sunday a commemoration sung of the Octave. At Compline the Dominical preces were omitted. At Mattins the invitatory is Adoremus Dominum and the Office hymn Nocte surgentes. In the first nocturn (Pss. 1, 2, 3, 6, 7, 8, 9, 10, 11, 12, 13 & 14) the lessons are the Incipit of the Second Book of the Kings. Lessons I and II are the same as in the modern edition of the Breviary, the third lesson continues Et ait ad eum ... Domini, i.e. the addition of v. 16. In the second nocturn (Pss. 15, 16 & 17) the lessons are taken from St. Gregory's Book of Morals. The fifth lesson is longer by a sentence and the sixth lesson considerably longer than those found in the modern editions. In the third nocturn (Pss. 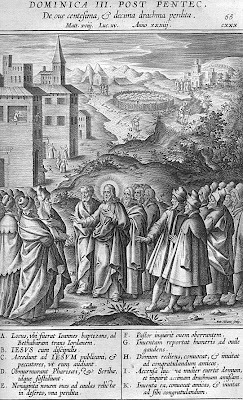 18, 19 & 20) the homily is from St. Augustine's First Book on the Sermon on the Mount. The Gospel fragment begins with the additional words of the LORD Amen dico vobis. The lessons are considerably longer than their modern equivalents. The Te Deum is sung. At Lauds the Sunday psalms (Pss. 92, 99, 62-66, Benedicite & 148-49-150) are sung. After the collect of the Sunday a commemoration of the Octave is sung. The Suffrages are not sung. At Prime (Pss. 53, 117, 118i & 118ii) Quicumque is sung but the Dominical preces are omitted due to the Octave. Vespers are of the Sunday, with psalms (109, 110, 111, 112 & 113). After the collect of the Sunday a commemoration is sung of the Octave of SS Peter and Paul. At Compline the Domincal preces are omitted due to the Octave. This year Sunday within the Octave of St. John the Baptist is the fourth Sunday after Pentecost. The liturgical colour follows the Octave and so Sunday is celebrated in white vestments. The Sunday is of semi-double rite. At Vespers yesterday afternoon the antiphons Paulus et Joannes etc were sung with psalms 109, 112, 115, 125 & 138. From the chapter was of the Sunday. After the collect of the Sunday commemorations were sung of the martyrs SS John and Paul and of the Octave of the Nativity of St. John the Baptist. The Suffrages were omitted due to the occurring Octave. At Compline the Dominical preces were omitted due to the Octave. At Mattins the invitatory is Adoremus Dominum qui fecit nos and the 'summer' hymn Nocte surgentes is sung. In the first nocturn (Pss. 1, 2, 3, 6, 7, 8, 9, 10, 11, 12, 13 & 14)the lessons continue to be taken from the First Book of the Kings. The first lesson is the same as found in modern recensions, the second lesson continues David autem...grandaevus inter viros (from the modern third lesson) and the third lesson begins Abierunt autem ... quadraginta diebus. However, it then continues Dixit autem... sicut Isai - from v. 17 through to half of v. 20. In the second nocturn (Pss. 15, 16 & 17) the lessons are taken from a Sermon of St. Augustine. These are the same as found in the modern editions. In the third nocturn (Pss. 18, 19 & 20) the homily is from St. Ambrose on St. Luke's Gospel, but the lessons are longer than in modern editions. The Te Deum is sung. At Lauds the Sunday psalms (Pss. 92, 99, 62-66, Benedicite & 148-49-150) are sung. After the collect of the Sunday a commemoration of the Octave is sung. At Prime (Pss. 53, 117, 118i & 118ii) Quicumque is sung but the Dominical preces are omitted due to the occurring Octave. Mass is sung after Terce. The Gloria is sung, the second collect is of the Octave. There is no third collect. The Credo is sung, the Common Preface is sung. Vespers are of the Sunday, with psalms 109, 110, 111, 112 & 113. After the collect of the Sunday commemorations are sung of the following feast of St. Leo II and the Octave. The Suffrages are omitted due to the Octave as are the Dominical preces at Compline. 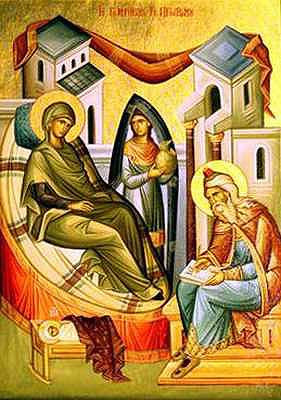 The great feast of the Nativity of St. John the Baptist is a double feast with Octave. The liturgical colour for the feast and Octave is white. The celebration of the feast on June 24th is ancient and is mentioned by the Council of Agde in 506 and in the Martyrologium Hieronymianum. The feast began with First Vespers yesterday. The antiphons, Ipse praeibit etc, were sung with psalms 109, 110, 111, 112 & 116. The Office hymn was Ut queant laxis resonare fibris. The hymn famously rises through a scale in its verses: Ut (Doh), Resonare, Mira, Famuli, Solve, Labii. At Mattins the invitatory is proper Regem Praecursoris Dominum, Venite adoremus. The Office hymn is Antra deserti teneris sub annis. The antiphons and responsories are proper for all three nocturns. In the first nocturn (Pss. 1, 2 & 3) the lessons are taken from the Incipit of the Prophet Jeremiah. These are identical to those found in the modern editions. In the second nocturn (Pss. 4, 5 & 8) the lessons are taken from a sermon by St. Augustine on the saints. The first lesson is slightly shorter than that found in the modern books with the omitted text beginning the second lesson. In the third nocturn (Pss. 14, 20 & 23) the homily is from the writings of St. Ambrose on the first chapter of St. Luke's Gospel. These are the same as in modern editions. At Lauds the antiphons Elisabeth Zachariae etc are sung with the Sunday psalms (Pss. 92, 99, 62-66, Benedicite & 148-149-150). The rest of Lauds is proper to the feast with the Office hymn O nimis felix. At the Hours the antiphons of Lauds are sung with the Sunday psalms. At Prime (Pss. 53, 118i & 118ii) the lectio brevis is Reges videbunt. Mass is sung after Terce. The Mass is proper, De ventre. The Gloria is sung, there is only one collect. The Creed is not sung, the common preface is sung. At Second Vespers the antiphons sung at Lauds are sung again with the psalms from Vespers for the Common of Apostles. The hymn Ut queant laxis is again sung, the rest of the Office is proper to the feast. The Vigil of the Nativity of St. John the Baptist is of simple rite and the liturgical colour of the day is violet. The Office begins with Mattins. The invitatory, hymn, the six antiphons and psalms of the nocturn are of the feria (Pss. 52, 54, 55, 56, 57, 58, 59, 60, 61, 63, 65 & 67). The lessons in the nocturn are a homily on St. Luke's Gospel of St. Ambrose. The lessons are the same as those found in the modern editions except the first lesson ends ...inter superiores semine rather than ...inter superiores familias. The three responsories are taken from the occurring feria. Lauds follow the third responsory. The ferial psalter is sung (Pss. 50, 64, 62-66, Exsultavit cor meum & 148-149-150). The chapter, hymn, V&R and antiphon on the Benedictus are from the feria. After the antiphon on the Benedictus has been sung in full at the end of the canticle the ferial preces are sung, kneeling, including the psalm De profundis. The collect is proper to the Vigil. After the collect of the Vigil the Suffrages are sung. At Prime the antiphons of the feria are sung with psalms 53, 25, 118i & 118ii. Both the Dominical and ferial preces are sung. The ferial preces are sung at the other Horae Minores. Mass is sung after None. The ministers wear violet dalmatic and tunicle. The Mass formulary is proper Ne timeas etc. There is no Gloria, the second collect is of the BVM, the third for the Church. Benedicamus Domino is sung as the dismissal. At Vespers yesterday afternoon the antiphons and psalms (Pss. 143, 144, 145, 146 & 147) of Vespers for Saturday were sung. The chapter was O Altitudo and the Office hymn O lux beata Trinitas. After the collect of the Sunday a commemoration was sung of St. Silverius followed by the Suffrages of the BVM Sancta Maria succurre etc, the Apostles Petrus Apostolus etc, of the Patron and lastly for peace Da pacem Domine etc. At Compline the Dominical preces were sung. At Mattins the invitatory is Adoremus Dominum and the Office hymn Nocte surgentes. In the first nocturn (Pss. 1, 2, 3, 6, 7, 8, 9, 10, 11, 12, 13 & 14) the lessons are taken from the First Book of the Kings. The are the same as in modern recensions, the responsories are Praeparate corda vestra etc. In the second nocturn (Pss. 15, 16 & 17) the lessons are taken from the Exposition on the book of Kings of St. Gregory. In the third nocturn (Pss. 18, 19 & 20) the homily (found near the end of the Breviary) is from St. Augustine but the lessons are longer than in modern editions. The seventh lesson is what is now L7 + L8. The eighth lesson is several sentences longer than the modern L9 and the ninth lesson is not found in the modern books. However this year the eighth and ninth lessons are read together to form the eighth lesson and the ninth lesson is formed from the historic lessons for St. Silverius. The Te Deum is sung. At Lauds the Sunday psalms (Pss. 92, 99, 62-66, Benedicite & 148-49-150) are sung. A commemoration of St. Silverius is sung followed by the Suffrages of the BVM, SS Peter and Paul, the Patron and for peace. Mass is sung after Terce. 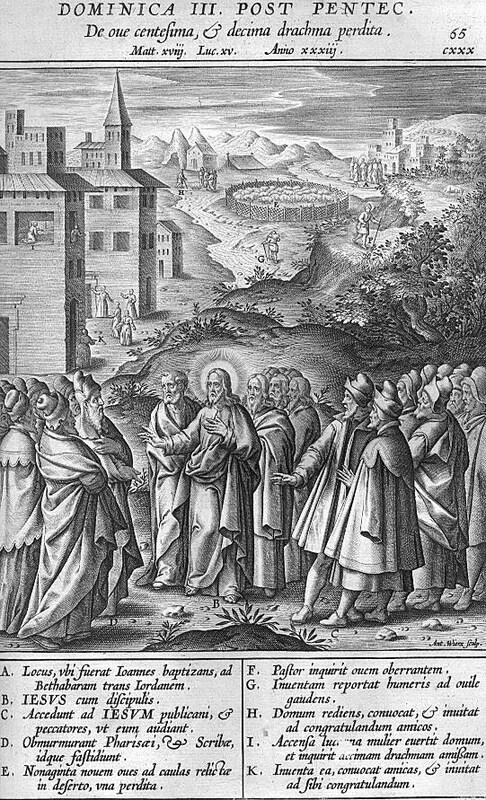 The Gloria is sung, the second collect is of St. Silverius, the third collect A cunctis nos. The Credo is sung, the Common Preface is sung.